Stop Focusing on the Job Title! Unfortunately, job titles are often inaccurate representations of the actual work done. For two key reasons: titles vary by company, and responsibilities change. Everything else being equal, one company may title you Vice President while another titles you Manager. A programmer may be a developer or an administrator (or perhaps even an analyst). And though you were hired as a web developer, your duties morphed over the years, while your title (perhaps more related to pay grade than duties) remained static. Realistically, titles are generally unimportant, except as an organization’s internal status indicators. That is, until you decide to look for another position; and then the question becomes: How do you describe yourself, knowing those who read your resume often offer only seconds of their attention, and it will focus on your title? 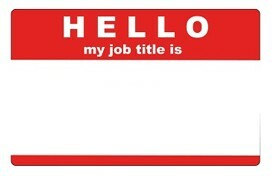 And another thought: how do you search for a job that’s perfect for you, while ignoring titles? Or if you’re the hiring manager, how do you attract the person you need when the company’s titles don’t fit the job?